Subject: Computer work, systems, Apple, Google, Facebook, Microsoft and Co.
We enable, for private or business users, an optimal use of computers, through workflows, archiving and an intelligent task management without having to think about, because the process is automatic. This is freedom for the brain. Look at most of the desktops. They are filled with a hotchpotch of files. That is not using your computer in a smart way, that's treasure hunt. Create a document, flick through email. Check it, make a decision, drive it forth and forget it. It'll come back to you when you need it. This is all synchronized with all your devices automatically and safe over any distance. multiEngine@easyGoing is computing easy like it has never been before, with maximum safety, in sync with all your devices and systems from anywhere in the world. Personal statement: I'm tired of being squeezed in a corset by the big Internet companies when working and getting information on the computer and, in addition to it, being asked to pay for it, all for the sake of their gaining more power and profits. which don't allow a smooth document and task management, and much less if working across platforms and independently of the various operating systems. There are also the different communication systems including their various apps which have to be embedded separately on each operating system. To work reasonably consistently, expensive additional systems would required which had to be operated and maintained by even more expensive administrators. All that would work on one system each only and possibly without any safety. With the whole thing taking place on the clouds of the big Internet companies most of the times, it is putting the fox in charge of the henhouse. Safety and confidentiality is something else entirely. For the individual user or a small business, it is not practicable, as for their lack of specialized knowledge and funds. 1. to place any kind of incoming and outgoing documents in a folder structure on an external medium right away into an inactive file at their final, central place where they can be tagged. 2. to send emails, texts, images, voice mails, music files, movies, videos etc. by a single click from any device and any operating system, from anywhere to a a central task management. 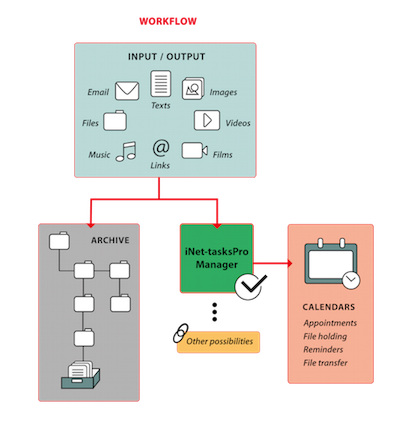 3. this task management to automatically convert the incoming files into tasks and inform me by email right after. 4. this task management to automatically send the tasks to any calendar which automatically reminds me of what I have to do at the given time. I want to be able to move this task and attach any files, URLs, and to open an email out of this task and send it. 5. to open any file from the archive folders in any editor anywhere to handle/process it further with the emails being openable in the original format or PDF. 6. not to have to upload any additional apps or software onto any system, and to be able to do all this from any device, any system, any any point in the world. 7. above all, to carry my own cloud around with me in my bag. I want my data to remain my property, be safe and hidden from view to be sent from one place to another. This is the least internet users should get without being bombarded permanently with advertising. And if a concern wants my data, I want to know precisely and surely what he does with them and that they will not be passed on. Moreover, I want an adequate return for it. For all this, I am willing to pay an adequate monthly contribution. As, unfortunately, none of these super corporations are in a position and able to offer me this at the moment, we have made it our mission to offer all this to anyone for a small monthly contribution. 4. if it is for a business, an absolutley safe cloud (eg easyGoing SFTP server, location Ireland). Of each of these media there should automatically be one backup created on another external media at least, if only ONE medium such as the easyGoing stick/computer or one of those mentioned under 1 - 4 is available. 1. In the event of an infection or a change of the computer system, or computer, it is easy to access the data without any big effort. 2. This enables simple access of your own data via the network or via mobile devices. Any email and document which is to be archived will be placed in the related folder at "save as" with emails being automatically saved as "name.eml" (on clicking an .eml file, it opens in the original email format). Any emails and documents which have to be processed or put on date/re-submission are automatically forwarded via secret easyGoing email address to the iNet TasksPro system. Immediately after archiving, emails may be deleted in the mail client or on the mail server (this has the mail client overseeably empty). Since iNet TasksPro may automatically be linked up with most calendar systems regardless of the system used, you will, at the due date, automatically be reminded of what has to be edited or moved by the calendar. With such a simple system it is easy to install an efficient search function using eg. tags which are supported by the current operating systems or can at least be set up with a small tag program. With multiEngine@easyGoing there will neither be a mess of documents again nor a daily email horror or missed appointments. Simplicity, clarity, saving time and freedom from stress with multiEngine@easyGoing.